The noise of broody geese with their honking hadn’t been the only disturbance through the night as a mirror carp of 24lbs had rued its mistake in triggering the trap I had carefully set. So sleep for me was at a premium but I still hadn’t managed a lie in with nature fully awake by 4.30am. Sat on my bed chair with a black coffee in hand a mouse ate the final boilie I had dropped and a kingfisher shot by flashing its azure blue coat, too busy to stop with a brood to feed. A beautiful and peaceful scene but one I still wanted to shatter with my quest for carp continuing. I had arrived the previous day and chosen to fish from a small peninsular that afforded access to the middle of the lake. Intel had told me that the majority of the fish were holding up in this area giving me a head start. 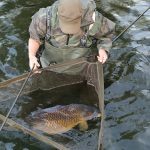 Such advice from a mate is invaluable for much of my fishing because the nomadic style of angling I enjoy does have a downfall and that is never getting truly in tune with a water. Fortunately I had bypassed this potential pitfall and even better 25 wraps directed to the tip of a far bank island would see a lead landing on a gravel clearing in amongst an ever growing bottom of Canadian pond weed. The hard part had been done for me now I just had to make sure I didn’t mess it up when it came to tackle and bait. 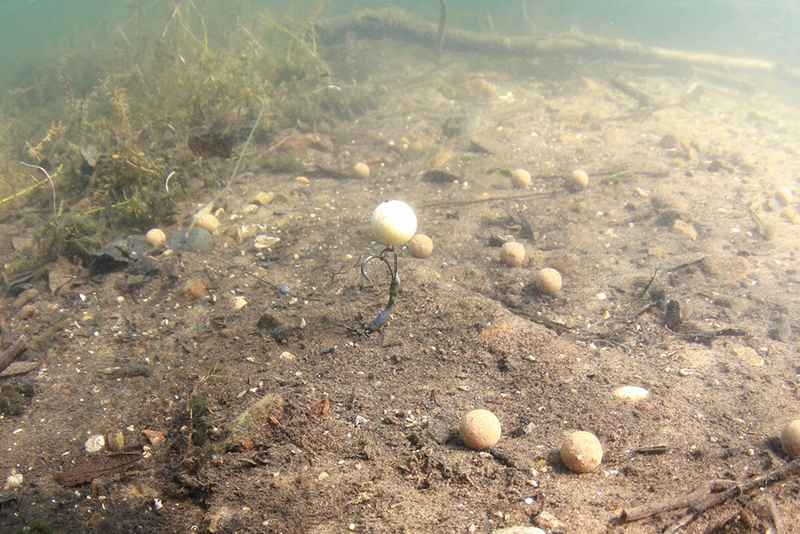 Boilies are hard to look beyond at this time of the year with the carp craving an easy meal. Predictably then Sticky krill formed the basis of the attack but I also wanted to maximise the underwater tow to draw fish to me. 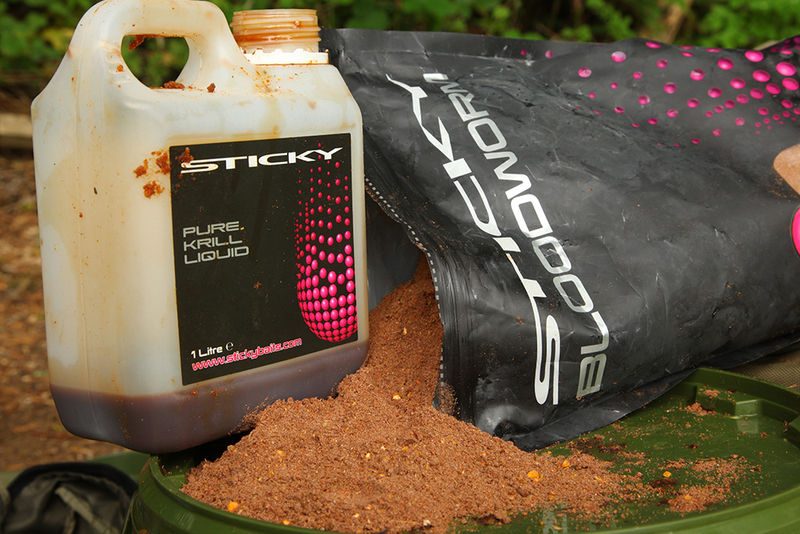 So I took half a bag of Sticky’s bloodworm mix and added plenty of krill liquid to it and a few handfuls of clusters. 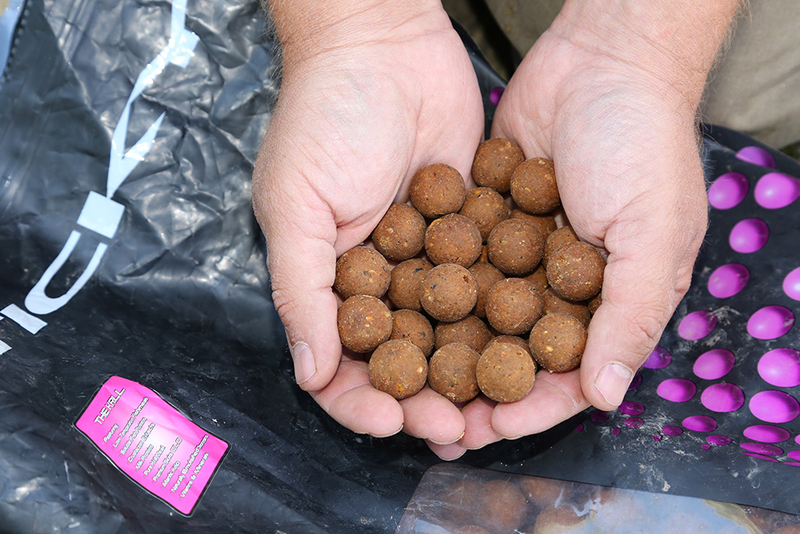 Now I had a great food source, the boilies and a slick of attraction working down the pit demonstrated by a huge flat spot emanating from the gravel clearing. 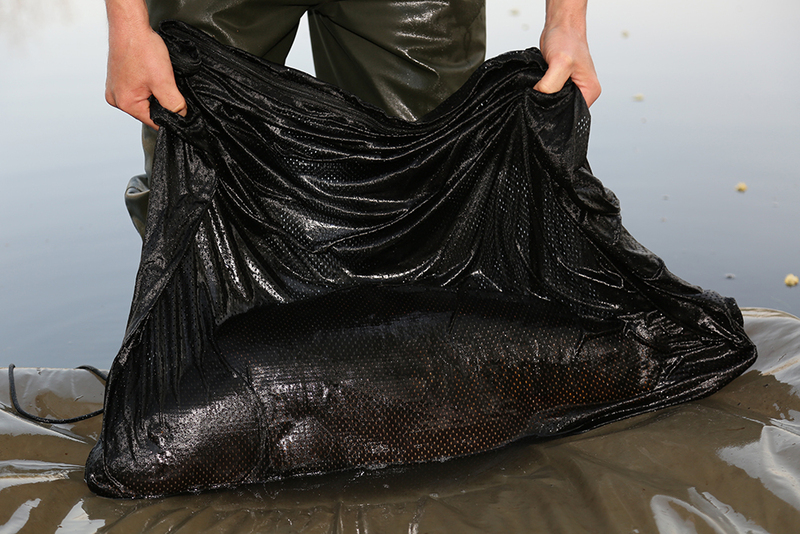 Tackle not only needed to be effective but also strong crossing numerous large weed beds. 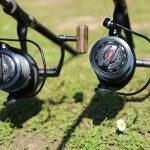 On the ESP reels was braid and I have to say in recent years dealing with big carp and lots of vegetation I have become a convert. This was twinned with distance Terry Hearn rods but only 2 as the area was just the size of a couple of dinner tables and I didn’t want to cramp it, potentially spooking the quarry. At the terminal end a clear leader and clip carried a 4oz lead leading to an 8-inch 20lb brown tungsten loaded hooklength and a size 4 cryogen curve shanx hook tied ‘Ronnie Rig’ style. I could have fished a bottom bait but given the carp’s early season naivety I felt I could get away with a pop up and in turn a wonderful hook hold afforded by a Curve Shanx. Why was this important? I suspected a difficult tug of war with the weed should a carp make a mistake. 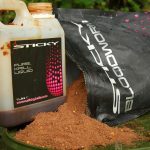 The last choice had been the type of pop up and again I decided to take advantage of the carp’s naivety by choosing a bright yellow and pink boilie from a tub of signature squids. 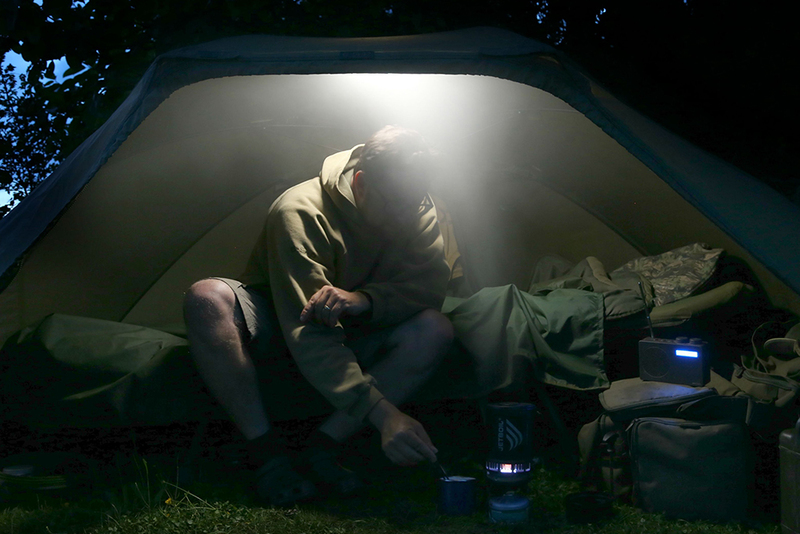 Confidence is so, so crucial and I had settled any early nerves with the mirror in the night. 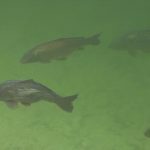 They were then completely dispelled as, from my early morning vantage point, I watched the tip pull down on the left hand rod. Now no thought was given to the wildlife and tranquillity as I charged towards a screaming alarm and a spool shedding braid rapidly. My involvement saw no initial slowing of the situation but gradually I began to tighten the drag and temper the anger of a big common. The situation was then helped immeasurably as its head ploughed into a big clump of Canadian plunging it into darkness and instantly calming it, allowing me to draw it the huge distance to the net without too much fuss. Twice more the same scenario was played out and I capitalised on a feeding spell as much as I could. 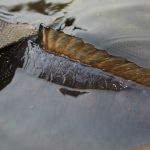 The best however was saved until last and this fish wasn’t fooled by a weed blindfold, demolishing a series of them as my braid severed stems in its wake. 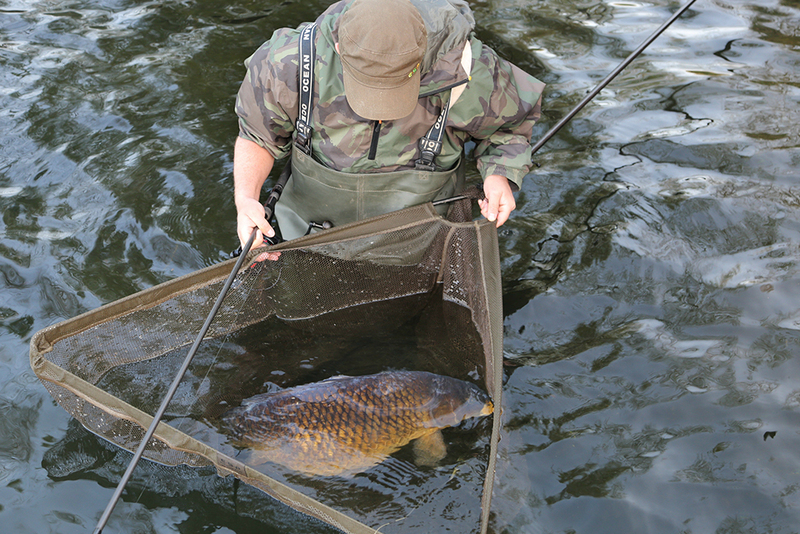 There wasn’t any let up in the margin either, typical of a big carp, plodding up and down under the rod tip. I could see what I stood to win or lose and I was excited; a long beautiful mirror with golden petals for scales scattered across a chestnut flank that gave way to a creamy yellow belly. 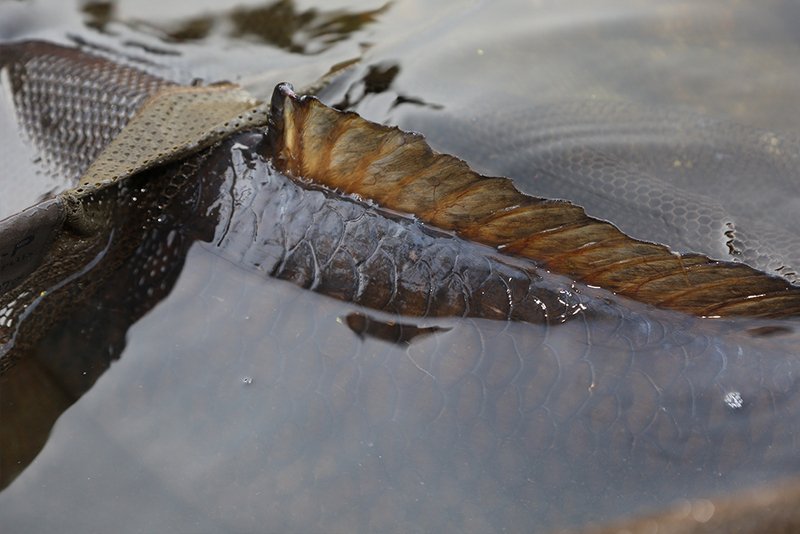 The net eventually confirmed what I had known for the previous 5 minutes – it was the prettiest looking carp I would hook all spring. The older I get the less interest I have in weights but after recounting the tale of my best looking carp I will continue with the biggest to date this Spring. A couple of weeks later I was back but my chance didn’t come at range, in fact the complete opposite. A gentle breeze pushed into the bottom bay and a set of dwarf lily pads rode the ripples. 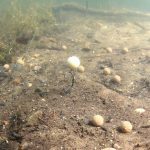 A congregation of floating scum made from blossom and floating weed sat between the pads and bank and this was the place I had thrown in a few handfuls of crumbled boilies at daybreak that were now resting on top of the silty bottom. Two return visits revealed nothing more but the third saw a giant rotund mirror servicing its portly belly by a set of lips sucking up the food. I needed to get a rig in place and quickly but without alerting the fish. Aiming for its head I plopped a single boilie into the margin and this was enough for it to mooch off without alarm. I rapidly lowered in the rig which was identical to the one used a couple of weeks previously. The pop up was perfect sitting clearly over the silt. This time a heavy fluorocarbon mainline was slackened off and the rod laid on the floor before I hid behind a small tree waiting for the mirror to return. 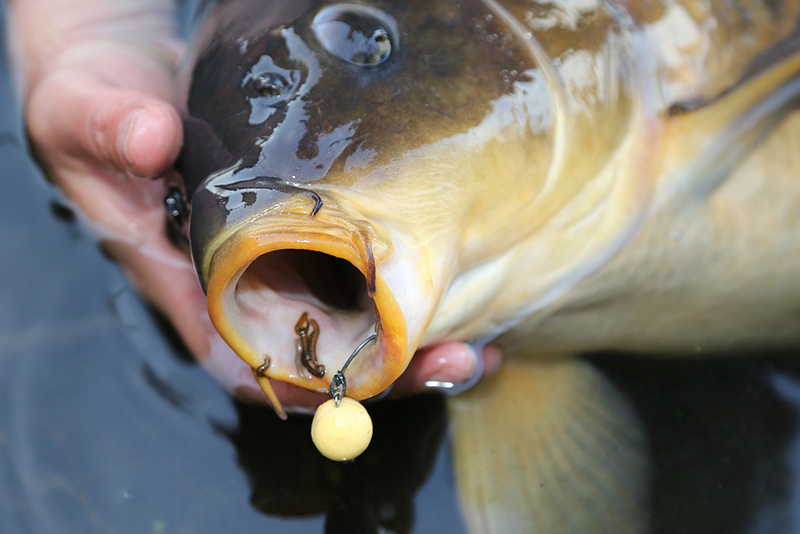 The lips on a 41lb carp are pretty big and this is what I was fixated by as the moved ever closer to the pop up. Then quite suddenly they stopped in tandem with the water boiling and the rod hitting my leg! 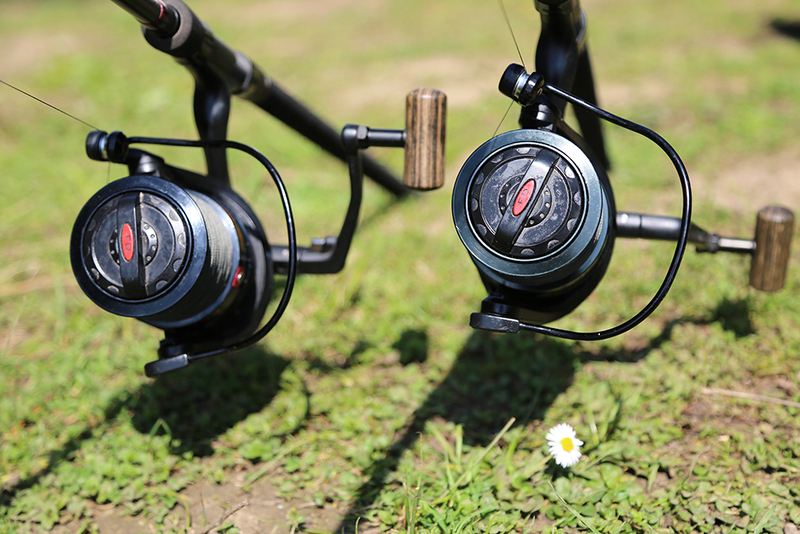 I had already planned on holding as much ground as I could given the lilies in front and snags to the right and as the rod took the carp’s best blows I was once more grateful for the curve shanx. On the fourth charge I toppled the beast causing it to somersault underwater. I had a new 40 to add to the collection but most importantly another great Spring memory. 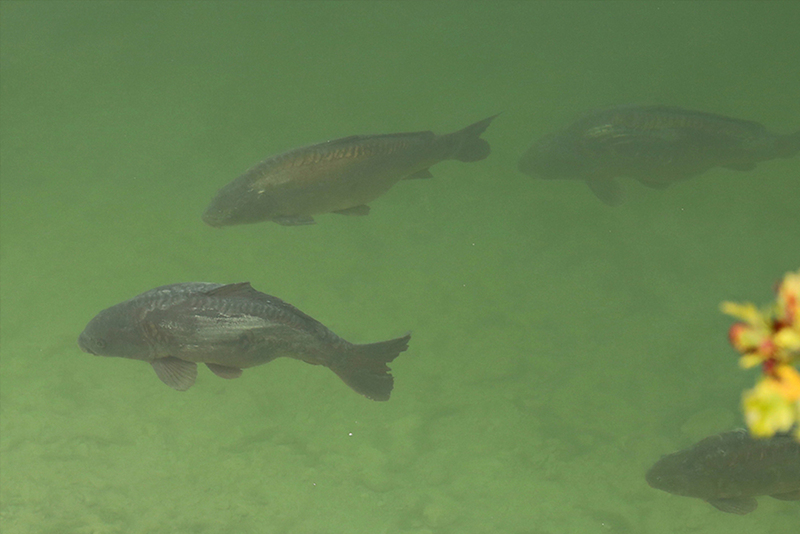 Use the underwater tow on big pits to your advantage and draw carp to you. Liquids and oils scent the water and can be detected over hundreds of yards. When targeting a small area at range I tie two marker gum knots to stop any possibility of slippage. 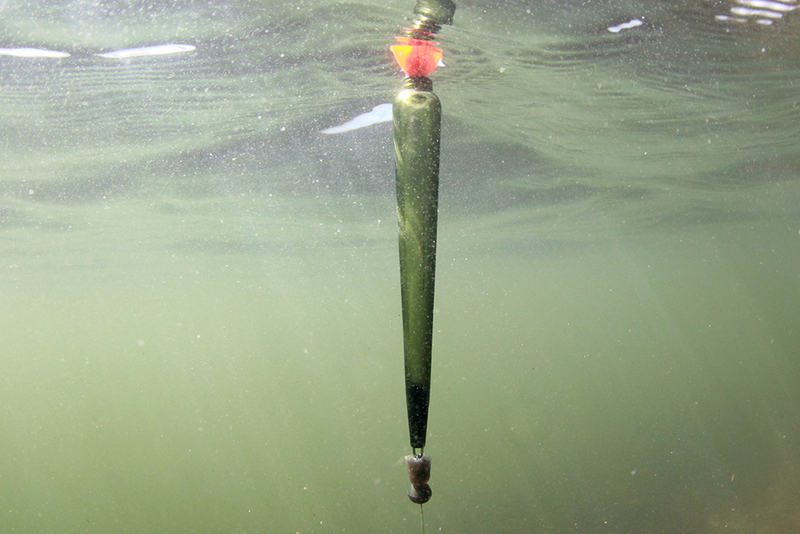 If you need a great hook hold use an ESP curve shank with a Ronnie Rig – it rarely fails. 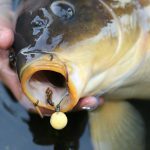 I know it’s fashionable to fish 3 rods in close proximity to each other but this isn’t the way to go for big old wise carp – less is more. 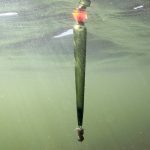 If the rules allow and the lake is weedy use braid – it is so much stronger and will sever vegetation. 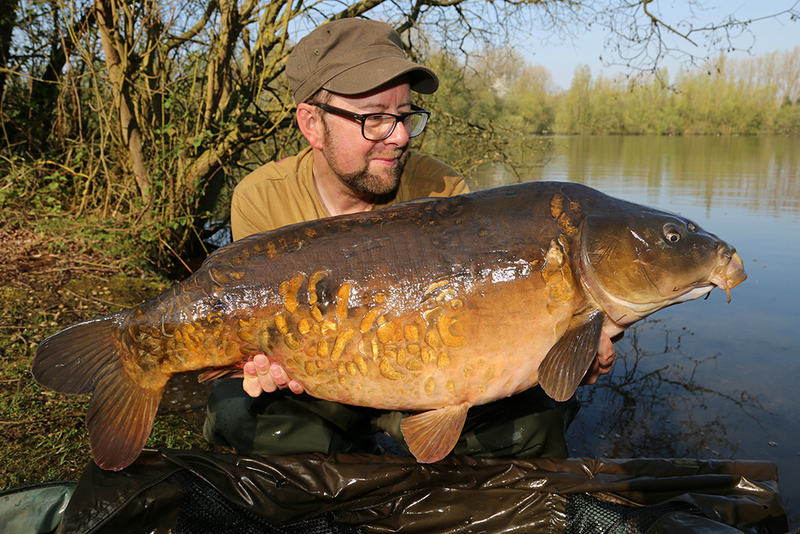 ← Kev Hewitt – Off to a flyer!